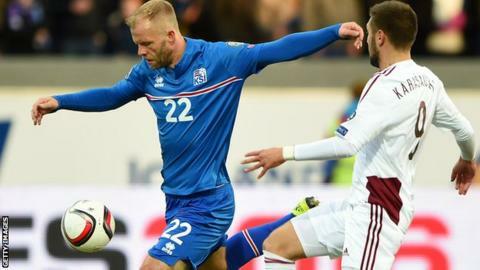 Former Chelsea forward Eidur Gudjohnsen has been named in Iceland's Euro 2016 squad at the age of 37. Iceland co-manager Lars Lagerback said: "If he hadn't found a club in January, he would not have been picked." Gudjohnsen, who has won 84 caps for Iceland, is arguably his country's most celebrated player, having enjoyed an international career spanning 20 years, in addition to winning two Premier League titles with Chelsea and the Champions League and La Liga with Barcelona. He retired from international football in November 2013 after Iceland lost a 2014 World Cup play-off to Croatia, but was recalled in March 2015. Gudjohnsen played three of Iceland's 10 Euro 2016 qualifying matches, scoring one goal as they reached a major tournament for the first time. He moved to Molde - coached by former Manchester United striker and Cardiff manager Ole Gunnar Solskjaer - with the intention of playing regular games in order to secure a Euro 2016 place. Heimir Hallgrimsson, who co-manages Iceland with Lagerback, said: "He has taken a step up at Molde. He looks fitter and has shown the desire necessary."